YAM discovers that trying something new and exciting — whether it’s the new fitness craze of bouldering or a real-life circus training workout — is the key to loving your workout. That time of year is back when, after all the remaining Christmas candies have been devoured and the final bottles of holiday liquor have been finished, you promise yourself that this is the year you’re going to the gym and getting in shape. That doesn’t have to mean running on a treadmill and lifting weights. In fact, if you are willing to try something unexpected and new, working out can be fun — to the point you forget you’re even exercising. I’d been a fitness nut — swimming at a high level, racing in triathlons and running for hours at a time — until I got into a bike accident. I’d lost my fitness drive. Even after I’d fully recovered from my injury, the only marathon I completed was binge-watching Breaking Bad. Warm-ups happened in the microwave and cool-downs in the fridge. It was time to make fitness enjoyable again. I thought about the kind of activities I loved as a kid — the ones that were, first and foremost, fun. Activities like climbing, jumping and twirling. Despite being in a fitness rut, just thinking about retrying those activities got me excited. 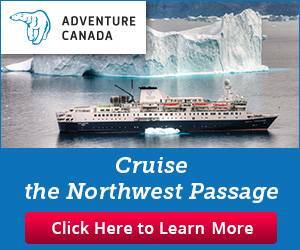 Turns out, there are places in Victoria to do all of these things. So I did. And trying something new and unexpected was just what I needed to rediscover my love of fitness. Bouldering is similar to rock climbing in that you’re climbing a wall, using only a few designated handholds and footholds. But it’s different in that there are no ropes, no harnesses and the walls are 15-feet-high instead of 35, 40 or even 50 feet as they are for rope climbing. If you fall, you fall on a crash mat — and yes, you’re going to fall. That’s what makes bouldering such an adrenaline rush. When I arrive at BoulderHouse for the first time, I instantly get the appeal. It’s basically a colourful playground for grownups, but with a lot more chalk and funky beats playing out of the sound system. I get the rundown on how it all works, fill out a waiver (all fun has a little risk, right? ), learn the facility’s safety procedures and rent a pair of climbing shoes. Then I learn what all those colourful holds on the wall mean. BoulderHouse has eight climbing circuits of varying difficulty and each colour represents a different difficulty level, the easiest being yellow. Jumping into 2018 like ?? ?Shoutout to @saabean for setting some sweet problems yesterday for the New Years reset! Fresh set on the front half on the wall! BoulderHouse, the city’s only bouldering-specific climbing gym, celebrated its one-year anniversary in October, and it’s gained popularity fast. I ask Robert Somogyi, BoulderHouse’s co-owner, why he decided to open a bouldering gym. “I think it was something Victoria really needed, and in my opinion, it’s more fun than regular climbing,” says Robert. “Bouldering reduces the barrier to entry to climb, since you don’t need to learn how to belay or how to work the ropes.” He adds that part of the appeal is how social it is — you can come alone and still feel like you’re climbing with friends. I experienced that too. I introduced myself to another young woman as we both attempted a blue-coloured route. We repeated the route over and over, both struggling but feeling motivated by the challenge. After a lot of failures and falls, in the end we both mastered the route — and we celebrated that success as new friends. Later, I ask Robert why he thinks this sport has such a broad appeal. 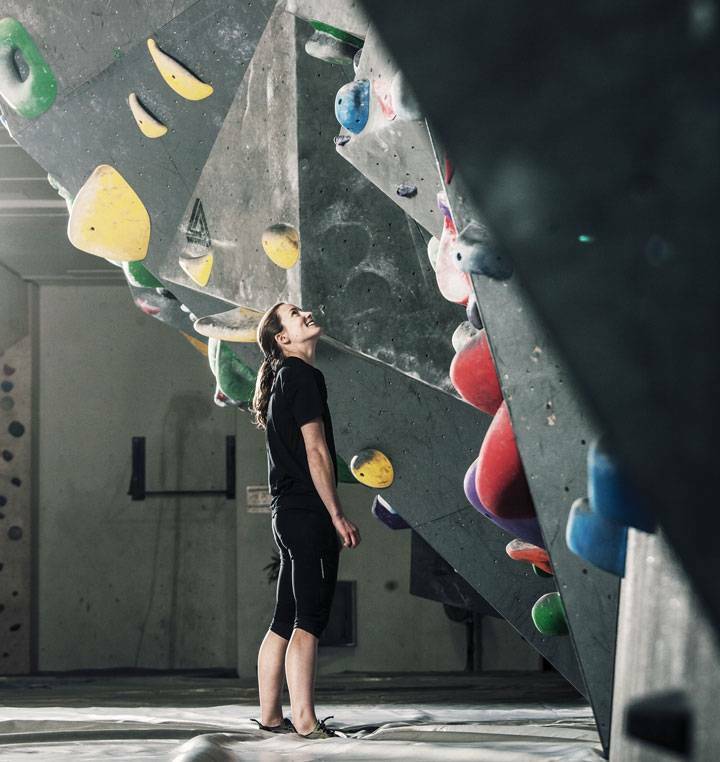 “It’s a type of exercise that’s so fun, you don’t even realize you’re exercising,” he says, adding that bouldering is a full-body workout that doesn’t target one specific muscle group. You’ll feel it the next day — mostly in your forearms— but this isn’t just a physical workout. Robert says it’s a mental workout too, as you try to figure out how to solve the puzzle to finish the route. In the coming years, expect more people to join in this sport. “This isn’t just a fitness fad. Bouldering is here to stay, especially now that it’s an official sport in the Olympics,” says Robert. Each successful climb is a small victory, and it doesn’t take long for me to feel addicted to the struggle and the subsequent successes. 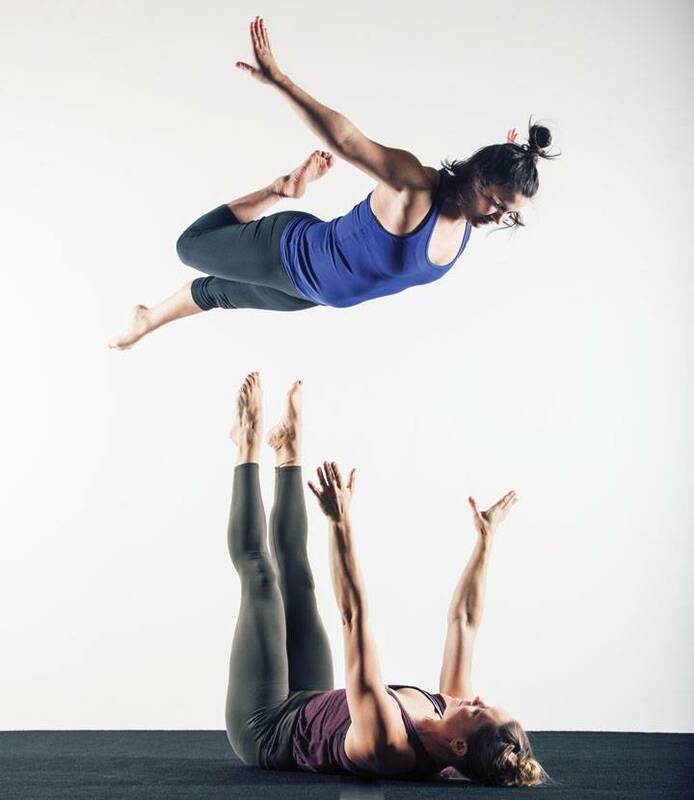 Island Circus Space co-founders Lisa Eckert (top) and Coral Crawford perform an acrobatic routine. PHOTO: JEFFREY BOSDET. Register for a class at Island Circus Space and you might feel as though your childhood dreams of joining the circus are resurfacing. Island Circus Space was co-founded by Lisa Eckert and Coral Crawford, both professionally trained circus artists with years of experience under their belts. Coral is a hand-balancing, aerials and acrobatics specialist who trained and performed with Vancouver’s Underground Circus. Lisa has toured the world with several circuses including Cirque Éloize, formerly a Cirque du Soleil partner company, after she graduated from the National Circus School in Montreal. Circus fitness is brand new to Victoria. This facility in Rock Bay opened for its first classes last November. When I arrive, I tour the space and learn that most classes are held on the main level, where all the hoops, balancing equipment and juggling apparatus are. Up a bright red staircase is a smaller studio space. “We have ground circus sampler classes which involve a little bit of everything, including juggling, acrobatics and tumbling, and handstand classes for different levels, flexibility classes, circus fit, acro-yoga and more …” says Lisa. Most recently, Island Circus Space added aerial classes. I’m here for a Cyr wheel class. (I’ll be honest — I actually had to Google what a Cyr wheel is.) A Cyr wheel is a large metallic ring that is taller than the performer — and as I soon discover, it’s way heavier than you’d expect. This is nothing like twirling with a hula hoop. The class begins with Lisa leading a warm-up and walking us through a simple tumbling routine. Then we each get our own Cyr wheel and learn how to hold and move with it. I do not feel graceful — this is an art and I discover quickly I’m not going to be able to use brute strength to master this. Lisa encourages us to work our way up to a single rotation while we stand on one foot on the inside of the wheel. I’m apprehensive at first, but after a few clumsy attempts, I turn 360 degrees while standing in the big hoop. And yes, I imagine I’m in the big top and now there’s a standing ovation for me. It’s challenging, but when you begin to get the hang of it, it’s incredibly rewarding. “It’s addicting because there’s always something new to learn,” she says. That’s true — as soon as I master one skill I’m eager to see if I can handle the next. In between juggling and flipping and other wacky feats, it’s easy to see why people fall in love with circus fitness classes. Each 60-minute session here is an excuse to discover what your body is capable of and to reach new heights. “And it’s more fun to lift people than weights,” laughs Lisa. You’ll get a workout, but circus isn’t just about the physicality. According to Lisa, a session is also about communication, creativity and imagination. 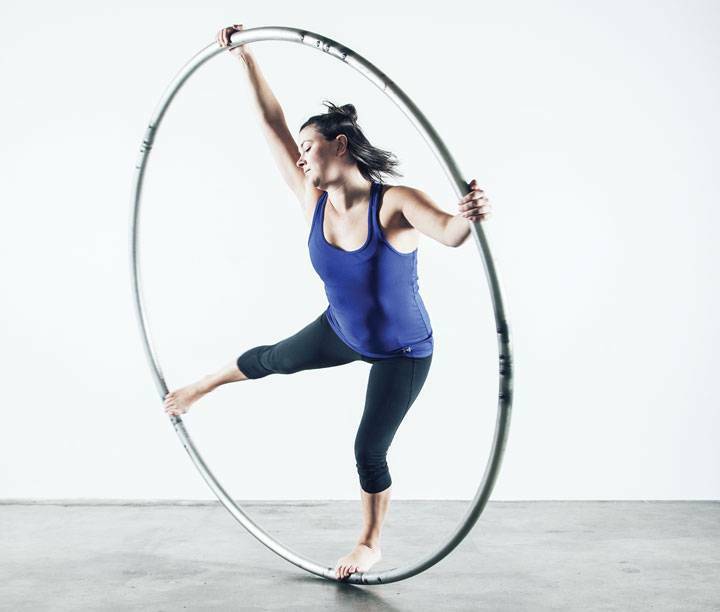 At the end of the class, Lisa shows us her moves on the Cyr wheel, which she first took on as her solo act while working with Cirque Éloize. She spins and cartwheels and balances with the wheel, and makes it all look effortless. It’s an amazing display of artistry and athleticism, and it makes me wish I’d taken up circus fitness about two decades earlier. Walk past Victoria Gymnastics after 8 p.m. on a weekday and you’ll hear excited chatter, the metallic sounds of trampoline springs and feet thumping on mats as tumbling routines wrap up. But this is not a kids’ gymnastics class — in the evenings, Victoria Gymnastics offers its adult classes, something the facility has held since the 90s. Sure, gymnasts peak in their teens, but some dreams never die. (What kid watching the 1996 Olympics wasn’t inspired by Kerri Strug?) And they say it’s never too late to try to conquer a new trick, whether that’s something as simple as a somersault or as complicated as a double tuck. So on the evening I visit, I channelled Strug’s athleticism and tenacity — minus the debilitating ankle injury, of course. Before the class gets started, I meet a few of the other adult gymnasts sitting by the balance beams and ask them why they choose to get their workouts here. One man explains that he only began when he was 40 years old and came with a specific skill in mind he hoped to master. Now, many sessions later, he can walk across the floor on his hands, seemingly without tiring. A young woman came with colleagues and just wanted to jump on a trampoline again. Another man just thinks it’s all fun. The adult classes are run in a way similar to classes for younger gymnasts, says Denise. “Except adults are much better listeners,” she laughs. After a group warm-up on the blue springy floor, we split up into three groups. One of the coached groups is at a long trampoline — a tumbling track — learning how to master a front flip and jumping into the foam pit at the end. Another more advanced group is working on their strength and conditioning by doing the circuit a coach has set up. I decide to stick with the coached group that’s on the floor and work on some tumbling. Muscle memory is a miraculous thing: it’s been 10 years, but with a little coaching, I remember how to walk on my hands. Toes pointed (you have to impress the imaginary judges), arms straight and strong, I make it across the blue mat — almost. I fall at the last minute, but it doesn’t matter. To me, making it that far was my Olympic gold medal. The 90-minute class zips by. I’ve been focusing so hard on mastering a new skill, and feeling like a kid on the trampoline, that the session is over before I even notice I’m working out. Denise assures me I did. “Gymnastics works your all-round fitness and you definitely feel how hard you’ve been working the next day,” she says. It’s extremely social. All participants are spotted and offered coaching and encouragement, and regardless of what level you are at, there’s a sense of accomplishment when leaving the gym. I can see that right at the end of the session. A young woman who was working on a front handspring successfully mastered the skill. “I did it!” She laughs, as if she can’t quite believe it. This year will be the year you get in shape, and you don’t have to be in a gym wishing you were somewhere else, doing anything else, to achieve that. When you try a new fitness experience and find something you love to do, surrounded by supportive coaches and encouraging friends, working out becomes something you look forward to doing. That might just require a little outside-the-box thinking to get you started.